Backstory: In September, I saw his Livestock Board mug shot (picture) on the New Mexico Horseman FB page and there was something about him that captured me. I don’t do rescues very often and I didn’t have room for him at this time, but still, there was something about him. 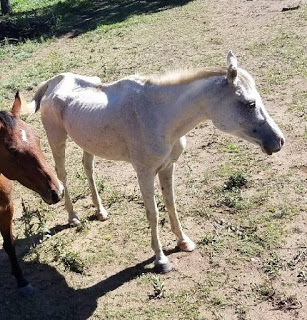 So, I called Char Hudson at Walkin N Circles rescue ranch to see if Walkin N Circles could possibly bid for him if I would provide financial support for about a year (which wasn’t that much, so don’t be terribly impressed). They won the bid, and WNC began the process of helping him recover by feeding him carefully, getting his teeth done, getting shots, etc. As you can see by the pictures, he is doing really well! And the best part is down below! 11/22/18 with Suellen, his soon-to-be sponsor!! Picture by Mary Ann Shinnick. As soon as he was out of quarantine, she started brushing him. He was very thin and she could only use a soft brush because a curry comb was too rough on his lack of subcutaneous fat hide. Then she started walking him. He was too puny to do much else, but he was very sweet. On Wednesday, she let him loose in the round pen, and while he is not ready for a fitness workout, he did take the opportunity to kick up and run around on his own! Now that he is no longer just surviving, he is starting to do some testing to see what the “real” expectations are around WNC! Suellen is looking forward to helping him figure it out! 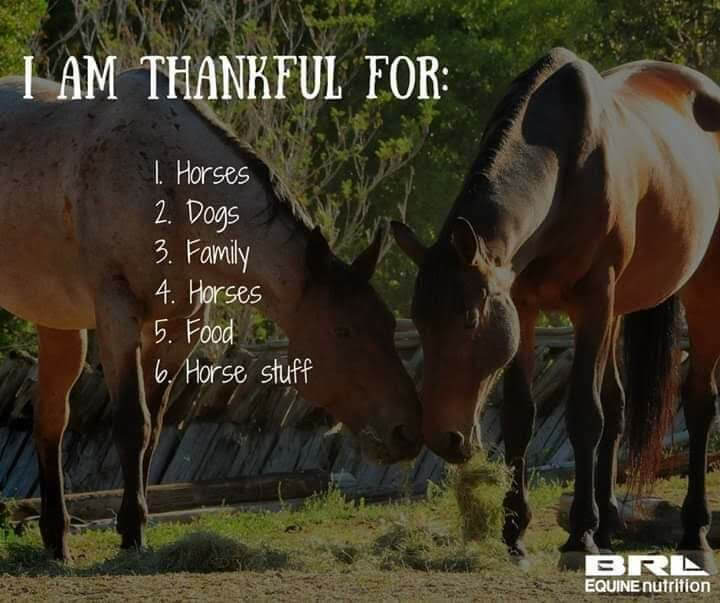 I got this from Donna Hurst and it made me laugh, (“Horse stuff” was the capper! ), so I thought I would share it!